Some years ago I purchased a mixed box of fairly tatty plants at an auction of a sadly neglected collection. I trimmed and propagated the living plants, but I could not identify one greyish-brown stick with a few ragged thickened leaves, so I ‘parked’ it. A couple of years later it started to grow after an accidental spring watering, and shortly afterwards I saw a photograph on the BCSS Forum of a plant that looked vaguely similar to my neglected specimen. I did some research and identified it as Xerosicyos danguyi. I took a tip cutting from the original battered ‘bin-end’ to obtain a more vigorous plant. It rooted quickly and the stem extended well, growing some nice clean new leaves last year, and then in the middle of winter it produced two clusters of small, strange flowers. Xerosicyos is a small genus of shrubby dioecious cucurbits that grow in south & south-west Madagascar on limestone or gneiss in dry bush and dune habitats. They are mostly climbers with bifid tendrils, but one (Xerosicyos pubescens) has an above-ground caudex. 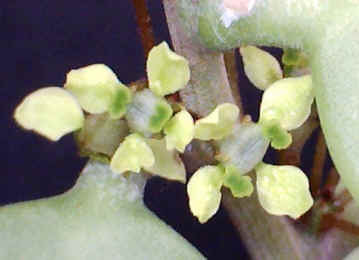 Xerosicyos danguyi has succulent leaves, a characteristic that is unusual in the cucumber family: compare the large caudex plants in the genera Corallocarpus, Gerrardanthus, Ibervillea, Kedrostis and Momordica. 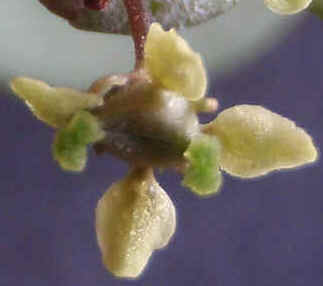 The flowers are borne on 10mm pedicels in loose fascicles (bundles) and are generally green or greenish-yellow. The male flowers are ‘square’ and open with four 3mm long petals and distinct stamens with pollen. The female flowers have similar sized petals and pairs of stigmas – as is the case with my plant. The fruits are, like many succulent cucurbits, brownish-orange ovoid objects; in this species they are 20mm long and dry. However I have yet to see any on my plant owing to the absence of a male flowering coincidently. 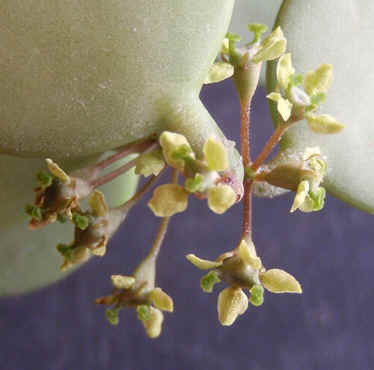 This species has a common name ‘The Silver Dollar Plant’ – quite appropriate since the leaves are circular and silvery-green in colour. 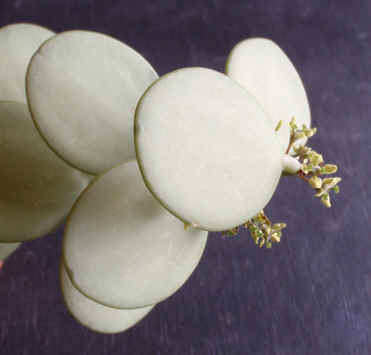 It is sold as a houseplant and whilst it may not be the most sculptural succulent, it is a tough addition to any collection. My, admittedly limited, experience indicates a neutral, well-drained compost works fine and my old plant is tolerant of 5C when kept dry over winter. However I kept the cutting above 12C and watered it all year in a propagator and it flowered; so you take your choice. I read that it flowers in the summer like other caudiciform cucurbits. If you appreciate the beauty of green flowers contrasted with silvery foliage/bodies like the cactus Echinocereus viridiflorus or the terrestrial orchid Cymbidium lowianum this is a plant for you! Also if any member has a male Xerosicyos danguyi please get in touch as I would like to try to pollinate mine. I have recently replanted a rock garden and made the tour of my favourite nurseries for new plants. 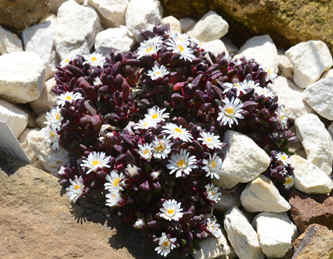 These days, beside the usual Sedum and Sempervivum, several new kinds of succulents are available from alpine specialists. I bought Rosularia sempervivum and a couple of Delosperma, D. congesta ‘Gold Nugget’ and D. ‘Ruby Coral’. So probably not a long term prospect. Delosperma nubigena. sometime called ‘sp. Basutoland’. comes from 3200m, (guess where? ), and has been around for some time. I tried it once outside and bits survived the first winter but not the next. In a cold frame covered for the worst of the winter it has run amok so probably just as well it is not too hardy outside. Whether these new species will survive will be tested. Naturally I will take a few cuttings as hostage to fortune. All the Delosperma I grow have been fine in a cold greenhouse. 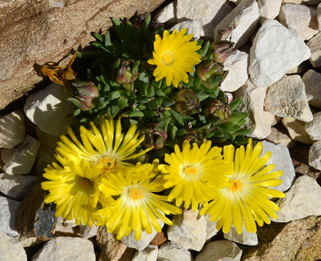 Delosperma sphalmanthoides is a little beauty. Right: Delosperma ‘Ruby Coral’. This seems to be fairly new to general cultivation with internet information from Holland and Germany. It is not clear what the species is though one site says alpinum and this seems feasible. These plants open their flowers at lunchtime on sunny days. The plants have just been planted out and are more or less as bought. So let’s see what happens in winter.